Thank you for asking; the graduation was lovely. But you can probably sense that’s the party line. The ceremony was actually surreal, emotional and intense. We are, as the old saying goes, in the big leagues. Next stop, university. 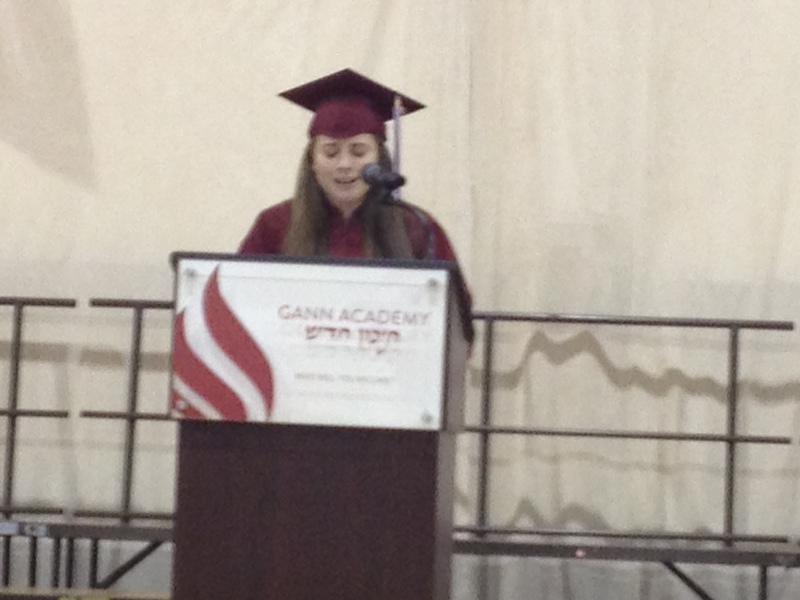 I’ve known a lot of Anna’s fellow Gann Academy graduates since kindergarten at Schechter in Newton. Over the years, I’ve stayed quiet in my role as chauffeur to eavesdrop on their arguments and their gossip. When they were in that state between dog-tired and overwhelmed, I heard about their dreams and their fears. In the mix of growing up together these kids have loved each other, hurt each other, admired each other and, in the end, I think they’ve come to appreciate the time they’ve shared together. Who knows when and where they’ll resurface in each others’ lives. As for me, I’ve watched the Class of 2012 sing and dance. I’ve watched them cry and fail. I’ve watched them whoop for joy when they aced a test. I’ve watched them be remorseful as well as get away with murder. No one grows up without witnesses. As I dabbed my eyes during the ceremony, what flashed through my head as quick as lightning was that no one parents alone either. Whether or not we admit it, we’ve all been in it together. By that I mean we have some piece of real estate in each other’s hearts and memories. We’ll think of each other at random times when we remember the eighth grade play, or the stunning senior class presentation that melded poetry and song and choreography, bringing us to our feet. Or maybe we’ll just sigh over that long-ago last day of kindergarten. And then at some point we’ll try to figure out when our children grew up. I can’t give you an exact event or call up that one defining moment that Anna and Adam became autonomous, fully separate from Ken and me. It might have happened as Adam shot up 11 inches in the last two years and steadily improved his running times. Gann is truly a place that fosters individuality while still emphasizing the importance of community. Who we become as a person before we leave Gann is just as significant as who we become as a class. In Numbers Chapter 24, Bilam, a member of the enemy nation of Bnei Yisrael, finds himself blessing Jacob and Israel as he looks upon their camp. As the spirit of G-d enters Bilam, he utters the famous phrase “ma tovu ohalecha Yaakov, mishkenotecha Yisrael, how lovely are your tents O Jacob, your dwellings O Israel!” In a moment of genuine awe and humility, Bilam first blesses the individual, Jacob, and then the community, Israel. Like Bnei Yisrael, Gann should be admired not only for the amazing individuals it produces, but also for the classes as a whole, each unique in character and reputation. Our class of 2012 is no exception. Amongst us we have varsity athletes, talented artists and musicians, jugglers, a cappella enthusiasts and even the lone Irish step dancer. However, each individual connects to those around them, latching on, creating a network that when viewed from the outside is beautiful both for the entities, and the class as a whole. These individuals together make up something much larger, perhaps even awe-inspiring when looked at with the spirit of G-d. May we always take pride in our individuality while finding strength in our community. The first time Anna read her speech to me, I broke into song. Literally. One of the first tunes I learned in Hebrew contained Bilam’s famous blessing. Lovely, billowing tents. The croaking chorus of 6th grade voices. I still remember those kids. Anna and I sang my version of “Ma Tovu” on the way to one of her graduation rehearsals. How lovely you are, Class of 2012. This entry was posted in culture, family life, Jewish feminism, Judaism, Parenting by judy bolton-fasman. Bookmark the permalink.